The world of Archaros is one with a great diversity of peoples, histories, fauna and flora. The first humans settled in Myrthia, while others diverged to form tribal societies on nearly every continent. After the capital of Myrthia exploded and magical runes rained from the dark skies, nearby empires fought for power, and exotic societies stepped out of the shade. Archaros is a tactical fantasy map featuring a unique world broken up by rivers and mountains. Colorblind friendly bonus palette and 13 superbonuses. Isolated Cities / Isolated Capitals: 24 or 8 starting positions, all equally close to a bonus. The Old World: A good rumble and then a good colonization. Don't limit the amount of territories you get in the beginning for maximum fun. 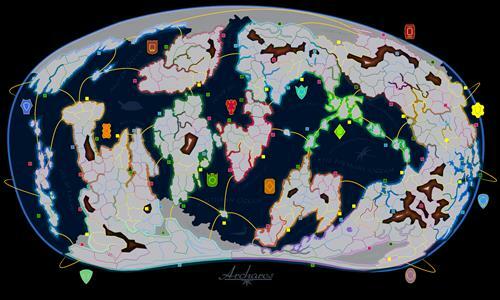 Kingdoms: 12 spread out small regions. Cardinal Empires: 4 large empires. Suggested for light fog gameplay. Hard Choices: 6 stretched out kingdoms spread over multiple superbonuses. A recipe for a messy war. Review by Ranek on 10/5/2015. This is map is an awesome piece of work for several reasons. There is an easy and well ballanced bonussystem, which includes nice features for clarity, like the coloured rims for the super bonusses or the colour variety for the minor bonuses. The number of territories and the seperated continents provide a bunch of possibilities for scenario/roleplaying games as well as competitive games. The amount of chokepoints, sea ways and mountains provide nice strategic opportunities. So overall, with its lovely, but descreetly artwork it is pretty much that what an average map in warlight should look like. Unfortunately, for warlight, this map is much above average, which is why it deserves 5/5, in my opinion. Review by Nathan on 10/5/2015. Incredible, beautiful map. Not only is the world of Archaros gorgeous, but it plays incredibly smoothly. The connections are clear and logical and the bonuses work well together. The maker plainly put a great deal of thought into this map - I especially appreciate the back story and the introduction of each scenario and distribution. Simply phenomenal! I found only one minor error - Teeth of Bondurat should not connect to Unukos. I want to use this respond button to thank you for reviewing so many new maps. It's clear that you take your time to write an informed and considerate review, which is nice since for some maps your review is the only one. Good reviews are helpful and motivating to mapmakers and I think that goes underappreciated. Review by DJ_Green on 12/20/2015. Review by Kain on 11/19/2015. Review by blob on 10/6/2015. Nice, clean appearance. Fun to play as well. Review by Fruity Freedom on 11/13/2015. Review by Micah F on 11/19/2015. Review by Trajan on 11/28/2015. good, but best for many multi-player games. Review by stjacky on 12/2/2015. Review by DanWL on 1/4/2016. Review by A Snyder on 11/2/2015. It's a nice-looking map, but some of the connections are tough to see. Review by Codemaster01 on 3/15/2016. Review by dmc-mohr on 7/13/2017. Review by Steveabode on 5/10/2017. Review by warhawk on 12/6/2015. As always in Warlight, the last player to make contact with another player wins !